The Double Diamond has experienced quite the roller coaster over the last several years. After beginning to fade from significance, a purchase by Nike had every boot fan hopeful that we would see the classic brand’s resurgence. However, after Nike had taken all the parts of Umbro that they wanted, the double diamond was cast aside. 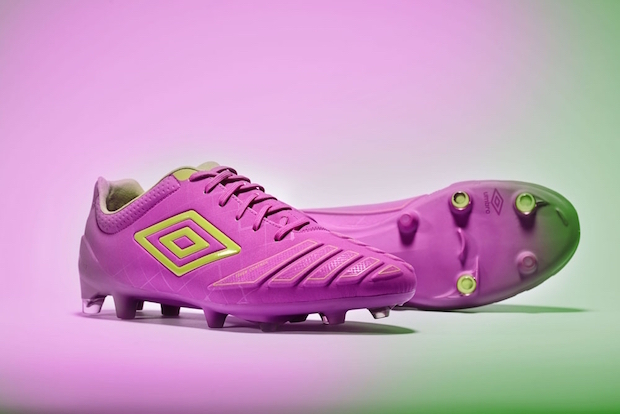 For most fans, this seemed to signal the end for Umbro…but, fast forward to 2016, and the brand has taken great strides to return to the top of its game. 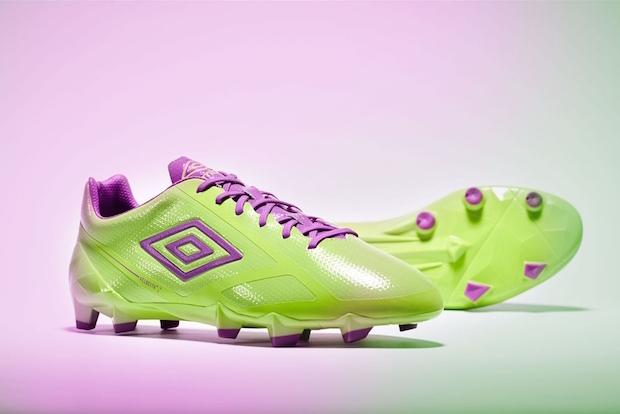 So, since the future seems bright for Umbro, then you might as well toss all your boots in green lime and a big dose of purple…right? Diving straight into the Umbro line-up, we start with the Velocita II. A speed boot that feels like it is a step straight from the adidas F50, this boot delivers lightweight feel with quality construction. While the first Velocita was a strong initial outing from Umbro, the Velocita II has minor tweaks and upgrades…definitely a case of “if it isn’t broke.” Doused in a bucket of lime, these boots will certainly stand out on your feet. 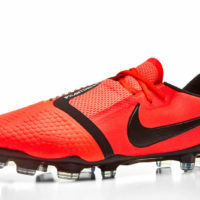 The brightest of the bunch, these boots will take a special kind of player to be able to pull them off. If you’ve been falling asleep at night with morose memories of your life with the adidas F50, this boot needs to be your next purchase. The next boot to look at is the Medusae. An impressive collaboration between the soft, buttery feel of a kangaroo leather forefoot and an extremely light synthetic making up the rest of the boot. The bright lime is only used as an accent color for this boot, with the purple dominating the Medusae. One of our favorite recent releases, this boot breaks in quickly and gives an amazing feel for the ball across the boot. The only real problem with the Medusae? That more people haven’t given this boot a proper shout…lighter than most “light” releases and with a leather that’s softer than your standard leather release…it’s all good under the hood here. 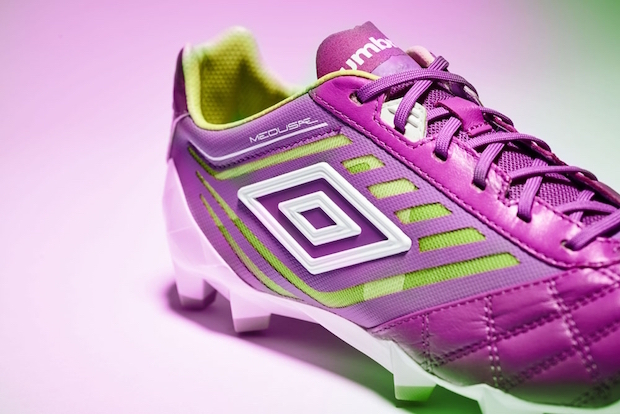 The last boot that’s been given the lime/purple treatment is the recently launched UX Accuro. A descendant from the maligned UX-1 silo, this boot has taken comfort to another level. With the tagline of “deadly comfort” from Umbro, we really shouldn’t have been surprised with how much we enjoyed this boot. If you’ve been hunting down a boot with shooting elements galore, a top-notch level of comfort/break-in, and bringing everything together without feeling bulky; the Accuro is perfect. Don’t expect to challenge the lightweight giants with these boots, but that’s not what the Accuro is about. Drenched in purple, these boots are meant to smash onto the scene with power and precision. Expect a review of this boot in the coming weeks (hint: it’s going to be quite positive). Umbro genuinely feels ready to stand up and be counted with this line-up. We hope that they continue to grow and push their way into the upper echelon of companies, and, if these are the types of releases we keep seeing from the double diamond, then it’s certainly a matter of “when” and not “if.” If you’ve been looking to depart the waters of the Swoosh or stripes, there isn’t a better time than now. Stand out, stand apart, and love every second of it. I bought my first pair of medusae boots and I can honestly say, they may be some of the best cleats I have worn. At first they are a little stiff but mine broke in within 45 minutes of play time. The only drawback I could find was the stud pattern is a little finicky. when taking off on the forefoot you tend to slip, I wear these mostly on artificial grass. I wore them on muddy grass once and had to switch to my old cleats at half time due to slipping about every other step I took. Which is understandable, this is not a soft ground cleat. 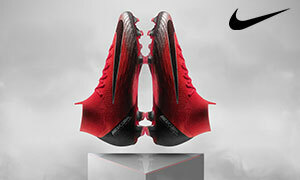 Besides the soleplate, this cleat is definitely worth a shot for anyone interested in leaving the ridiculouslyrics priced and poorly made new Nike and Adidas cleats.